A 7-year-old boy was hailed for giving up his prized possession in order to help Puerto Rican families affected by the hurricanes – and he was rewarded for his kindness by his all-time favorite sports hero. Alex Ibarra is a huge soccer fan who owns a collection of 54 different jerseys – but there is one shirt that he treasured above the rest: an autographed Christian Pulisic jersey from the American Outlaws Oakland team. Ibarra had first gotten the jersey signed during the March World Cup qualifier in San Jose. When he heard about the state of Puerto Rico following Hurricanes Irma and Maria, however, he donated the jersey to a raffle that would raise money for hurricane relief efforts. 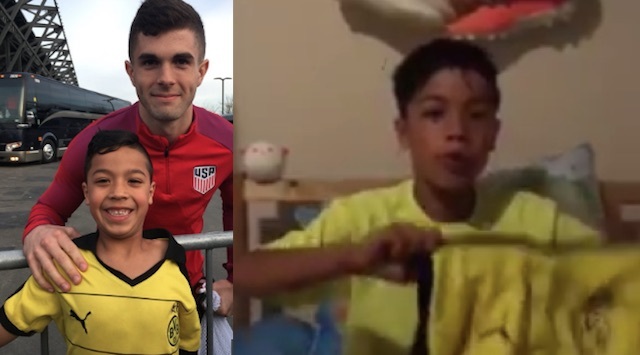 While the 7-year-old Junior Capo wasn’t donating the jersey for praise or attention, the news eventually made its way to Christian Pulisic himself. A young fan donated his @cpulisic_10 jersey to benefit #PuertoRicoRelief. Word got back to the ?? star. 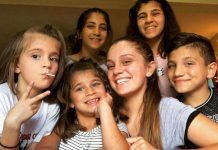 In recognition of the little philanthropist, Pulisic recorded a special video of himself for Ibarra saying that he would be sending the youngster another signed jersey to replace the one he donated. He also said that he would be making a donation towards Puerto Rico relief efforts to follow Ibarra’s example. During the AO Oakland’s viewing party for a match against Panama, Ibarra finally got to see the video of his idol thanking him for his generosity – and he was speechless with happiness. If that wasn’t reward enough for Ibarra, the raffle ended up raising roughly $3,300 for the Hispanic Federation UNIDOS Disaster Relief Fund, too. 7-year-old Alex watched @cpulisic_10's message at the @AOOakland party.